Python is a programming language that can be used by beginners to coding as well as experienced computer programmers. 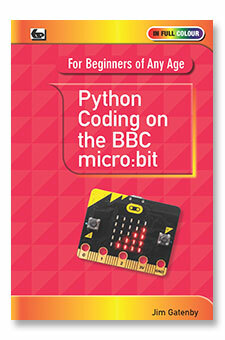 The version of Python that is used on the BBC micro:bit is called MicroPython which is a full implemen-tation of Python 3. So if you wish to advance to more advanced machines you will use the same language that you are familiar with. The book will show you how to download the ‘Mu’ MicroPython Editor (and any necessary drivers you might need) so as to be able to check your pro-grams after you have written them. This book will explain in plain, simple English the basic skills needed to start coding in Python which is easy to learn yet powerful enough for demanding professional and scientific applications. It has a number of worked program examples that introduce progressively more aspects of coding. Suitable for beginners of any age! 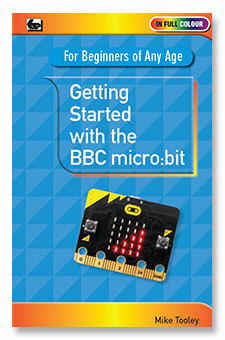 Not just an educational resource for teaching youngsters coding, the BBC micro:bit is a tiny low-cost, low-profile ARM-based single-board computer. The board measures a mere 43mm × 52mm but despite its diminutive footprint it has all the features of a fully-fledged microcontroller together with a simple LED matrix display, two buttons, an accelerometer and a magnetometer. Mike Tooley’s new book shows how the micro:bit can be used in a wide range of applications that include simple domestic gadgets to more complex control systems such as those used for lighting, central heating and security applications. Using Microsoft Code Blocks, the book provides a progressive introduction to coding as well as interfacing with sensors and transducers. Each chapter concludes with a simple practical project that puts into practice what the reader has learned. The featured projects include an electronic direction finder, frost alarm, reaction tester, battery checker, thermostatic controller and a passive infrared (PIR) security alarm. No previous coding experience is assumed, making this book ideal for complete beginners as well as those with some previous knowledge. Self-test questions are provided at the end of each chapter together with answers at the end of the book. So, whatever your starting point, this book will take you further along the road to developing and coding your own real-world applications. The National Curriculum for primary and secondary schools in England makes it compulsory for all children to be taught coding. One of the most popular coding languages is PYTHON which is both powerful and easy to learn. While many schools and colleges use Windows and Apple desktop and laptop computers, at home many children, older students ,parents and grandparents may only use tablets and smartphones. Fortunately, PYTHON programs can be coded on both Android and Apple tablets and smartphones allowing children to practise their coding skills at home. PYTHON programs can then easily be transferred between the different types of computer available at home and school. While there are many books covering PYTHON coding on Windows and Apple computers, the above book will probably be the first to cover coding on iPads and iPhones. 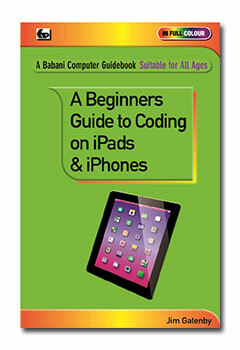 The book will explain, at an elementary level, the basic concepts of computers and computer coding / programming before explaining how to download and install the necessary FREE PYTHON software on iPads and iPhones. The book then describes in plain English the basics of coding in PYTHON, followed by saving and running the code and transferring to other types of computer. While there are many books covering PYTHON coding on Windows and Apple computers, the above book will probably be the first to cover coding on Android Tablets and Smartphones. 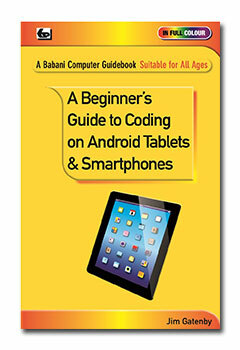 The book will explain, at an elementary level, the basic concepts of computers and computer coding / programming before explaining how to download and install the necessary FREE PYTHON software on Android Tablets and Smartphones. The book then describes in plain English the basics of coding in PYTHON, followed by saving and running the code and transferring to other types of computer.